Everyone loves a rag to riches story. Most of us love a rags-to-riches story even more! Champaign ILL is the best of both. It is a closer look into the life of three friends who put college on hold for a year to go chase fame and fortune, and many, many years later, life yanks the rug out from under them. It is also an examination of the mutual co-dependence of its lead characters and their entourages. 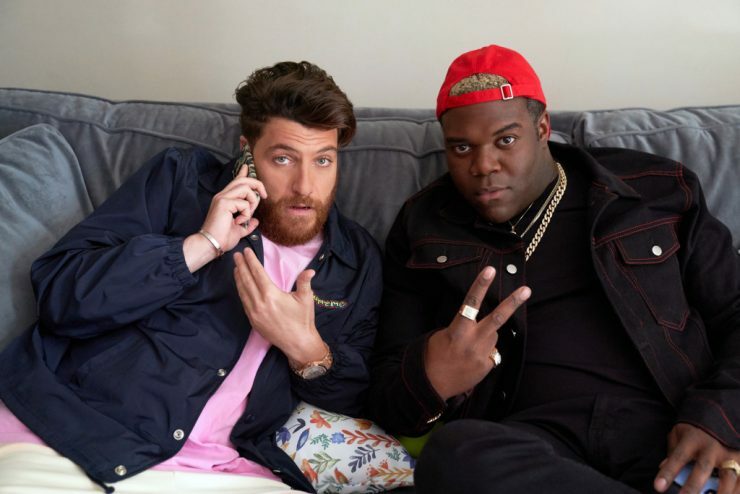 Champaign ILL is created by David Caspe, Jordan Cahan, and Daniel and Matthew Libman, and mainly revolves around Ronnie and Alf played by Adam Pally, Sam Richardson. This YouTube Premium comedy series is a mix of dark humour and a tale of coming of age, about a decade too late. Champaign ILL has some great writing showcasing aged millennials trying to hold on to slipping edges and keep up with fresh trends and latest pop culture while being comprehensively excluded from it all. This buddy comedy is absurd, and fun, and draws from the minds of adults who find themselves stuck in arrested adolescence. Comic timing is another way in which the show really works, and the gags are delivered with a certain buffoonish elegance. Champaign ILL Cast: Who’s in it? This charming, and hilarious show stars Adam Pally as Ronnie, Sam Richardson as Alf, Keith David as Lafonso, Allyce Beasley as Gayle, Curtis Armstrong as Burt, Sabrina Revelle as Courtney, Danielle Schneider as Shayna, Jay Pharoah as Lou, Neil Casey as Craig, Rich Sommer as Zack Chevalier, and Adriyan Rae as Tasha. Champaign ILL Plot: What is it about? Champaign ILL is a story of arrested development and a belated coming of age. Ronnie, Alf, and Lou are the three best friends who strike it big just when they graduated high school. Ronnie, the genius, had plans to go to Yale, Alf wished to marry his long term sweetheart, and Lou had just managed to sign a big recording con, tract likely to make him a hip-hop superstar. As Lou heads to Miami, he asks his two best friends to join him for the ride, and they agree! After all, they figure, they can go to college next year! It’s fifteen years hence, and only Lou has succeeded in making a name for himself; he is a famous rap icon, and as part of his entourage, the other two, cocooned in the fame and fortune of their best friend, lose their own identities and become the quintessential star people, selfish, totally image-minded, with a complete failure to grow up. An unfortunate turn of events results in Lou’s death, and lands Ronnie and Alf, broke, non-famous, and forced to slum it, back in their parents’ homes in the Champaign. If they are ever to try to get back everything that they have lost, and rediscover the potential they had so long ago they must quickly figure out a way to grow up, to leave their juvenile and destructive behaviour behind, and to get back to the top of the heap! Their struggle to settle back into the small-town of their youth and adjust to the loss of their B-list celebrity and entourage status is hilarious, and the jokes are quite well-timed. Champaign ILL has black-comic elements that stem from the characters and their jaded world-views and the show relies on the chemistry between the actors. The actors seem to feed off the talent of each other, and the well-written script adds to the overall charm. Well rounded and layered characters, complex story arcs, and flawed but likeable main characters make for an enjoyable watch. This Netflix show seems to have a low score at most review sites but deserves far more than viewers seem to be giving it credit for. The low visibility is one of the issues that has kept it so underrated. Champaign ILL Season 2 Release Date: Cancelled or Renewed? Champaign ILL first premiered on YouTube Premium on December 12, 2018. However, the channel has since come up with sad news for the fans of the show. It has been announced that YouTube Premium has cancelled the show as of April 10, 2019, and so there is no chance of viewers getting a season 2. As part of its aim to expand its viewer base, YouTube has decided to let go off scripted series and focus more on unscripted TV as well as venture into music and educational genres. This is probably the reason why Champaign was cancelled along with a few others. Below is the trailer for the season if you would like to give Champaign ILL a go.